Love my swing, very durable and made well. This swinging wicker loveseat from International Caravan is the perfect warm-weather furniture addition for your porch or yard. Hand woven around a steel frame built to hold 400 pounds, this seat is strong, stable and durable. Sturdy, rust-resistant chains for hanging and treated UV-resistant wicker will protect this loveseat from prolonged exposure to the elements. Pick from a variety of cozy colors to match with your home. I love this swing!! It matched my existing whicker chairs perfectly. The only reason I am not giving it 5 stars is because there appeared to be a bit of rust already in a couple of spots. I'm not too worried about this though, since it is on the front porch and is covered. Plan on buying extra chain, too, because the chain that is included with the swing left it about 3 feet off of the ground. The swing arrived in surprisingly good time (3 days after ordering) and in very good condition (well packed ... no dings). It looks exactly like what was advertised. We bought the white color. The swing is sturdy and has what looks like a strong frame throughout. The underside too has five bars running that hopefully provides enough support to increase the life of the swing. There is too much resin though -- so it does feel more plastic and less wicker. But, that might be a problem with all wicker swings these days -- with the market's emphasis on easy cleaning and maintenance. Our patio has an 8 foot ceiling, so the chain that came with it was too long. It looks like the chain will fit a 10 foot ceiling. It was easy to move the links and "re-size" the chain to fit our needs. 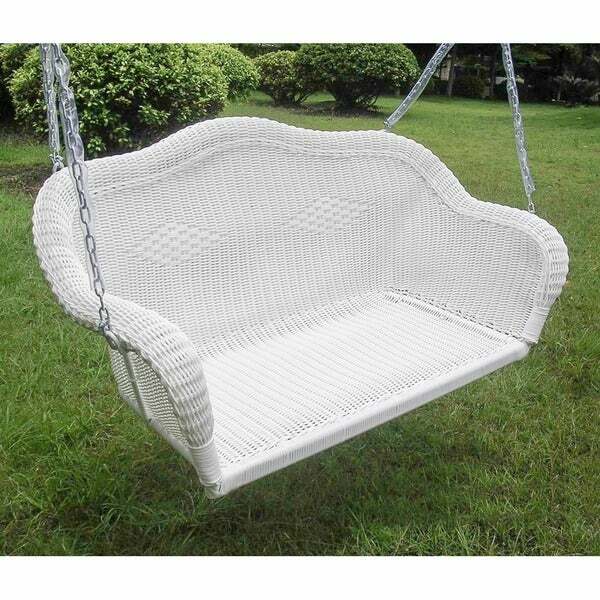 International Caravan Resin Wicker Hanging Loveseat Swing. Shipped Within The Estimated Time frame issued at checkout. Arrived issue Free. Thanks so much for a great purchase! Cute and very comfortable, It's been hanging outside under a covered porch all winter and does not show any sign of weathering. I also bought the Ash Hill Wicker loveseat cushion (44" x 19" x 5") and it fits perfectly. We love it!! By the way, it arrived in one piece and was easy to hang once we installed the ceiling hooks for it. Ceiling hooks were purchased separately. I ordered this in antique black and received it very quickly. It looked more like a dark brown, not much black at all. I called and they sent a new one out and had the other picked up no cost. I received the 2nd swing and it was dark brown again. After contacting Overstock again we figured out that indeed is was the antique black.....just didn't look like what I thought antique black would be. I ended up keeping the swing because I just love it. Comfortable, well made and a great price. Overstock was very helpful and their customer service was awesome in dealing with the issue. They are looking into changing the description of the color. It's a great swing!!! Looks nice and is comfortable! I am so happy with my purchase! This swing looks great, matches my house nicely, is cozy and classy all in one! My children love swinging in it and my husband and I enjoying relaxing in it! A great addition to our front porch. Makes our home more welcoming and completes the look we were going for! The swings weave pattern and color were a very close match to outdoor furniture we had purchased years ago. The product came very quickly and looks great out of the box. Time will tell on the longevity of the product but its apparent quality is evident right out of the box. After the first one arrived we ordered and received a second one!!! Beautiful addition to our deck. Love! Love! Love! The swing is well made and very comfortable. The resin wicker is closely woven and a brilliant white. The swing chain is extra long so plenty of length for installation. Would highly recommend. I love my Wicker Swing it is perfect for my front porch! This swing and well-made and looks great! It arrived fully assembled. Just take it out of the box and hang it. The resin wicker looks good and should last a long time in any kind of weather. Very happy with my new swing. You will need cushions for the seat and back rest. Product is not too sturdy looking especially the base where one has to sit with the family. It looks that within few seasons the base will give way (does not have additional reinforcement). Also it is unfortunate that Overstock doe not have an outdoor frame to go with this. I ORDERED IT FOR MY FRONY PORCH BECAUSE IT LOOKED JUST LIKE WICKER, ONLY ITS MADE TO LAST ..I ALSO ORDERED THE ROCKER, AND THE TABLE. LOVE THE LOOKS AND THE COMFORT. Very pleased with purchase. As pictured. Easy to hang. My wife always wanted a porch swing and we now had a house that had a place for it. It's made well but not sure about the rust since we leave it up all year and live 6 blocks from the ocean. With a cushion, it become very comfortable. I didn't purchase the special hangers for the swing, but I would recommend buying them. Love this swing...comfortable even without cushion! My kids and I love this swing. It’s sturdy and well built. I bought this about four years ago. It still looks great and shows no wear and tear. Very well made and beautiful. Very fast delivery too. Well satisfied. I love this swing! It is large and roomy and I like that it is made of resin so that when sitting, it is smooth to the touch (which also makes it easy to wipe off after a rain or a season of use). I have the dark brown color and like how after 3 seasons of hanging on my porch, it still has not faded. I live where we can have harsh fall and winter seasons so I store my swing inside during these months but each spring when it returns to my porch, I always receive many compliments on the character it lends to my home! Lovely swing and very practical for outdoor use. I had this swing for years and loved it ! Its design is so unique and was just the right decorating treasure for my porch! It was comfortable and just the right size for the three grand babies and I. The songs we sang and the stories we told and the silly jokes they took turns making up! What treasured moments we shared in this lovely swing! You will love it for your quiet time for reading and a short little doze now and then. I have a two porch swings I love them both they are on our front porch and back deck!!! We received our swing, and it was in perfect condition. We hung it and have enjoyed it on our veranda. Overstock, you do a great job. "If I am sitting and swinging will I be able lean my head back against the back of the swing ... I am only 5’ tall/short!!! Thanks for anyone’s help ..."
Almost but not quite all the way. I hope it helps. "How far apart should hooks be in ceiling?" There is no specific distance. The one installing it should determine that. I hope it helps. "I have a dark brown wicker set on my front porch and am looking for a wicker porch swing to hang. I am looking at the antique black because I do not like the 2 tone colors of the antique pecan. Would the antique black be a lot different color than the dark brown?" "how do I shorten the chain on my swing ?" I would not necessarily shorten the chain because there is a screw on c-clamp to easily position the length that you want. Then the extra chain can be used in case you want to move the swing elsewhere. If you still want to cut the chain I believe you would need a bolt cutter. "What are the actual seat dimensions?" The dimensions are 42 inches wide x 19 inches deep..
"What's the depth at the deepest point? I want to make sure it doesn't end up in front of the door..."
"Is "mocha tan" and "mocha" from the same product line the same color?" Top 5 Mother's Day Gardening Gifts from Overstock.com. If your mom loves to garden, get her a Mother's Day gift that honors her favorite hobby. Best Porch Swings for Your Home from Overstock.com. Our guides provide customers with information about the best porch swings for your home.